Dirk De Mits was born in 1947. He graduated as Civil Engineer at the University of Ghent (Belgium). In 1975 he was graded Shodan by Satoshi Miyazaki Sensei, who also promoted him to Godan in 1992. For more than 30 years he has been the President of the Belgian Amateur Karate Federation, the national JKA organisation. In this federation he is a member of the Dan grading committee and trainer of the Flemish judges and referees. In 2001 he became an international JKA referee. 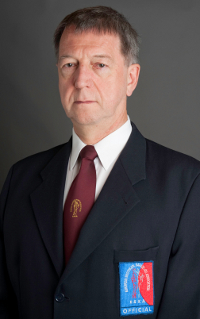 Since 1991 Dirk has served as a member of the Executive Board of the Belgian Karate Federation, the national umbrella federation, of which he was President from 2006 until 2010. In 1986 he co-founded of ESKA and has since that time held the positions of Secretary-General, Treasurer, and Director of Competition; all this with great support from his partner Cathy. As co-founder of WSKA, he also fulfilled the same mandates until 2009.